German cheat and bot maker Bossland has been ordered by a California court to pay Blizzard nearly $8.6 million in damages. Blizzard has always taken an active stance against those who create cheats for its games, as we saw with StarCraft 2 cheats in 2010 and again in 2014. Now Blizzard has won a California court case against Bossland, the German developer of cheats and bots for a number of Blizzard games, including World of Warcraft, Diablo 3, Heroes of the Storm, Hearthstone, and Overwatch. Blizzard has been fighting Bossland in courts in the US, UK, and Germany for quite some time. 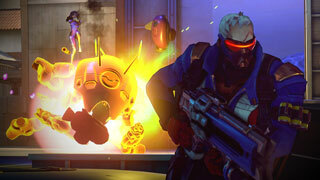 Blizzard recently received favorable judgments in the UK and Germany as well. UK residents who attempt to visit Bossland's website are blocked, and instead see a message that explains that selling its software to "any person resident in the United Kingdom, constitutes an infringement of Blizzard's intellectual property rights and an inducement to players of Blizzard's games to breach their agreements with Blizzard." In the California case, Blizzard argued that "The Bossland hacks destroy the integrity of the Blizzard games, thereby alienating and frustrating legitimate players and diverting revenue from Blizzard to defendants." Blizzard also stated that Bossland had reverse-engineered its software and altered games without permission. Although Bossland had attempted to get the case thrown out, it did not appear to defend itself in the California case, and the court found for Blizzard. The court then ordered Bossland to pay $8,563,600 in statutory copyright damages for 42,818 violations, and further ordered it to pay $174,872 in attorney fees. In addition, Bossland is prohibited from marketing or selling any of its cheat software in the United States. Bossland CEO Zwetan Letschew had previously told TorrentFreak that the company planned to continue the fight in the courts once the default judgment was filed in California. It remains to be seen how future court cases will go, but for now, you can expect that Bossland products won't be sold in the US.